A Sub-Domain is not the same as a Domain. The name Sub-Domain implies that it is a part of the Domain name. Facebook.com is an example of a Domain(main page). It is the basis on which all websites are built. A Sub-Domain is as the name suggests, a subset of the main domain, for example tools.godaddy.com. The extra tools is the part that tells us that the page is a Sub-Domain. Its basic need is based on the fact that any web page cannot provide all the information in a single page in an organised manner. It a sub part of the website, that contains additional information. For example, a college website has separate pages for existing students and prospective students. This prevents confusion. Both these pages are called a Sub-domain. A Sub-Domain, also called a child Domain, is just a sub-part of a larger Domain name in the DNS ( Domain Name System) Hierarchy. The DNS is a tool converts the domain name to its Name server’s IP address and then accesses the website. The DNS hierarchy is a multi level hierarchy, that has a root-level Domain at the top of the tree followed by the top-level Domains. The top level is followed by the 2nd level domains, also called the name servers. After these finally comes the Sub-Domains. The second image, tools.example.com is a how a Subdomain usually looks. Step 2: In the Drop-down, choose the Domain name to which you want to create a Sub-Domain. Step 3: In the Box before the Domain name you selected, type the name of Sub-Domain you wish to create. Step 5: Click on the Create button. You now have a new Sub-Domain. Sub-Domains don’t always inherit all the good part from its root domain. Some other Sub-Domains on the same root domain may have a better rank. Whereas, some get no benefit at all. For instance, in Wordpress.com, any user can make a new Sub-Domain and conveniently publish it. 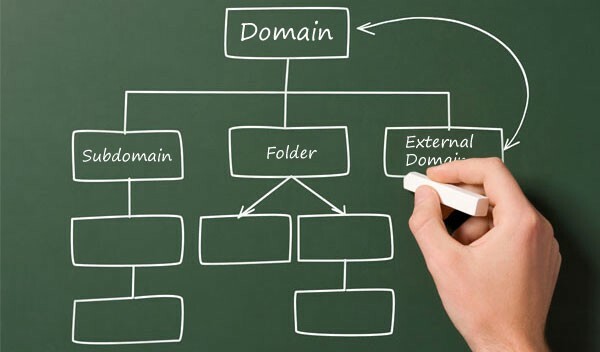 To improve the ranking of your website, it is recommended to keep only one Sub-Domain under a root domain. Sub-Domain helps to organise your website into Support, FAQ, help, contact and more such pages. Sub-Domains can also be created when you wish to share the disk space with other people. A Sub-Domain’s main advantage is that it can be created for each person you want to share your space with. You can also give them permission to access the space using their own username and password. Sub-Domains also help in organising the email addresses that come to separate departments on your website. For example, support@want2host.com and care@want2host.com. Creating a Sub-Domain, especially for URL’s that are very long, also help in remembering them easily. Long URL’s can be cut into a short Sub-Domain. This is especially helpful when one is dealing with a URL that has various special characters including ‘&’, ‘?’ and more. A Sub-Domain can be really helpful. But, you should keep in mind that when you offer Sub-Domains to your friends or colleagues, you are responsible for the Disk Space use and Bandwidth.